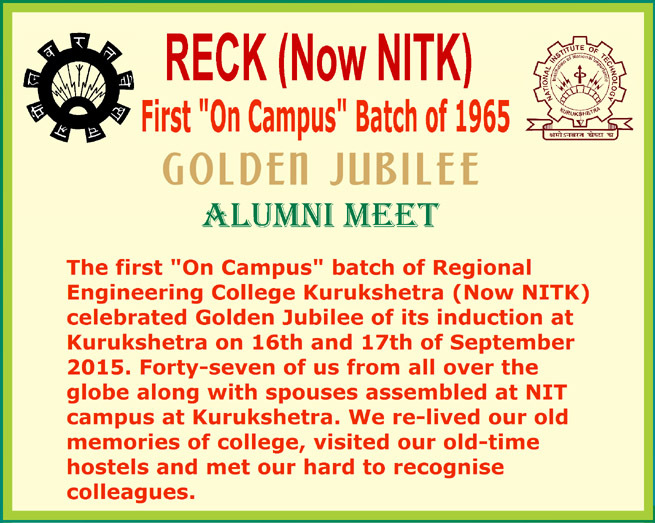 NITK is one of the 15 Regional Engineering Colleges, established in different regions of the country sponsored by the Union Government and is run under a joint and co-operative enterprise of the Central Government and the State Government. The Scheme for this college to be established at Kurukshetra, was sanctioned by the Central Government under its letter dated the 26th February, 1962 but it was only in 1965 that the first admissions were made at Kurukshetra from 1st September, 1965. Before 1985-86 the Institute had both undergraduate and Post graduate programmes of instructions leading to B.Sc. Engg., M.Sc.Engg. and Ph.D. Degrees of Kurukshetra University whereas the Institute switched over to the Four years B.Tech. Degree Course from 1985-86. It was converted to National Institute of Technology and also as a Deemed University wef 26/6/2002. ©2008-2009 Regional Engg. College Kurukshetra 1965. All rights reserved www.reck65.com.